General ginger facts. Ginger mainly controls inflammation (bingo!) and eases nausea. Indeed, its possible preventive effect on nausea and vomiting related to chemotherapy is currently under study; see the ginger clinical trial at: http://tinyurl.com/284xcq . Herbalists use ginger to treat bronchitis, arthritis and ulcerative colitis. Apparently, it can relieve cold and flu symptoms, and also sore throats. For general information on ginger, see http://tinyurl.com/ys3frq and http://tinyurl.com/2abqh2 (the latter link is to a University of Maryland fact sheet that tells us how to take ginger, and provides dosages). I keep fresh ginger in my freezer, and cut off and peel pieces to add to my juices. It adds a lot of pizzazz to them. By the way, should you decide to chew on a piece of ginger, be prepared for some spiciness. Wow. Ginger and other cancers. Studies at the University of Michigan Comprehensive Cancer Center have shown its use against ovarian cancer that becomes resistant to standard chemotherapy. Researchers noted two effects when they added ginger to ovarian cancer cell cultures: 1. it induced apoptosis (which, by the way, has become one of my favourite words in the English language), and 2. these cells digested or attacked themselves in a process called autophagy. Another great word. See http://tinyurl.com/2xfc9u for more information on this study. Another interesting titbit is that these researchers are also looking at resveratrol and curcumin. Need I say more? 🙂 In 1996, ACA was found to inhibit oral cancer in rats: http://tinyurl.com/2fdzgk The above-mentioned apoptotic effects of ACA have been observed in human myeloid leukemic cells, and the following study, published in Clinical Cancer Research in 2004, suggests that it be used in the treatment of myeloid leukemia: http://tinyurl.com/2czdng. The anti-cancer effect of gingerol, a ginger extract, was tested also on colorectal carcinomas, with positive effects. See the BBC news report: http://tinyurl.com/2qae2u. Conclusions. I have only scratched the surface of the anti-cancer effects of ginger. I will try to follow any progress made in this field, and report it here. However, perhaps the most significant discovery I made in doing research for this post is the osteoclast inhibition by ACA. I don’t mean to recommend that we start eating a ton of ginger (as I recall, 4 grams is the maximum tolerated daily dose), but my research strongly suggests that we incorporate some fresh ginger into our diet. It certainly can’t hurt, and it can also add flavour to what we eat. Add some sliced ginger to any meat dish, for instance, and give it some zing! Big Heart But No Bone Lesions! Several months ago I subscribed to the http://beating-myeloma.org/ website and have now signed up for its newly-created MM listserv, which focuses on alternative and complementary treatments. If you are interested in supplementation, nutrition, exercise, detoxification etc., please have a look at the website and sign up for the listserv (click on Forum/Listserv and follow the instructions). Once you have done that, check out the Listserv Help for information on how it works. It’s easy! For instance, if you have a question about a supplement you are taking, or would like to know if there is anything you can change in your diet, simply go to the website and post your query. Someone is bound to answer. The new listserv offers us an opportunity to share our experiences and, I hope, find new, perhaps even creative ways of dealing with this cancer, whatever stage we are in â‚¬”MM, MGUS or SM. I also subscribe to two other MM listservs, which means I do a lot of reading every day!, but I think that the more information and sources of information we have on this cancer, the better. So, go on and join! I say, the more, the merrier! 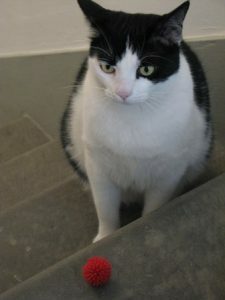 My black and white cat, Piccolo, is obsessed with balls. He joined our family about three and a half years ago, when he was five months old. He was small for his age, so we named him Piccolo, which means little in Italian. As fate (or diet) would have it, my Piccolo is now a big boy. He must weigh at least eight kilos (about 18 lbs). From the very beginning, he wanted us to throw balls, which he would retrieve and bring back to us to be thrown again. And again and again. As a kitten, he never seemed to tire of this game (we did!). Our bedroom faces the staircase. At night, Piccolo will still bring me a ball and eagerly wait for me to throw it down the stairs. He then shoots off the bed and down the stairs like a furry rocket, but within a few seconds he is back, spitting the wet-with-cat-drool ball into my lap, as proud and happy as though he had brought me a hot cappuccino and brioche (my secret dream…). At least twice a day he brings me a ball when I am in my study. If I ignore him, he will reach up and tap me on the arm. If I continue to ignore him, he will become a bit more insistent, digging his sharp little claws into my arm or leg. Then, when he starts getting tired of the ball game, he will begin dropping the retrieved ball farther and farther away from my desk chair, so I have to get up in order to toss it down the stairs. Like most Italian kids, he loves to play soccer. He frequently waits on the stairs (see photo) with a ball placed in front of him. He will call your attention to the ball, which you are supposed to kick towards him so he can try to stop it from flying down the stairs. Sometimes he jumps up high and catches the ball in both paws, like an acrobatic goalkeeper. Indeed, we should have named him Gigi Buffon, in honour of the Italian soccer team’s world-class goalkeeper. Piccolo frequently walks around the house carrying a ball in his mouth. When he encounters one of us, he will drop the ball, always ready to play. He is a clean boy, and will often drop his balls into the cats’ water bowl to give them a wash. Of course, he then forgets to take them out of the bowl. Piccolo is a wonderful but rather heavy lap cat. When I am in bed, he will lie on me for hours, purring or sleeping or looking at me in adoration. As soon as I finish dinner, he will jump into my lap. Whenever I sit down, he seems to be in my lap. He is a big talker, too. He chirps and makes weird un-catlike noises, telling me how he feels about things. I don’t really understand, but will helpfully chirp back. He likes to bump foreheads with us before mealtimes from his perch above the kitchen counter. Bump bump bump. When he wants to get my attention, he will sometimes give me a gentle slap in the face, no claws. Piccolo also enjoys leaping after flies and jumping on top of the furniture. But, most of all, he loves playing ball. This morning I read the most recent article sent to me by a member of Prof. Aggarwal’s team at the MD Anderson Cancer Research Center in Texas (for more information on these curcumin-related mailings, please leave me a comment here). Today’s article, titled ‘Spicing up’ of the immune system by curcumin, was published in the January 2007 edition of the Journal of Clinical Immunology. The abstract can be read at: http://tinyurl.com/2734me The study focuses on how curcumin affects the immune system, and more than reinforces my conviction that, whenever possible, ALL cancer patients should be taking curcumin (see my Warning section for counter indications). Indeed, healthy people should be taking it (at low doses), or should be using the spice turmeric in their cooking. Why? Because curcumin PREVENTS illnesses of all kinds. Not just cancer. Have a look at the following list, which, sorry!, does repeat a few of the things that I have written in other posts (last month’s Curcumin, a Panacea? ), but hey, repetition is not necessarily a bad thing. Study excerpt: [ ] Turmeric has been used as a non-toxic drug in Ayurveda for centuries to treat a wide variety of disorders including rheumatism, body ache, skin diseases, intestinal worms, diarrhea, intermittent, fevers, hepatic disorders, biliousness, urinary discharges, dyspepsia, inflammations, constipation, leukoderma, amenorrhea, and colic. Turmeric has been considered as an emmenagogue, diuretic, and carminative when taken orally, whereas topical application is commonly used to treat bruises, pains, sprains, boils, swellings, sinusitis, and various skin disorders. Turmeric is used to treat angina pectoris, stomach-ache, postpartum abdominal pain, and gallstones in the Chinese system of medicine. It seems to promote the qi flow, stimulates menstrual discharge, and relieves menstrual pain. The poultices prepared from turmeric are topically applied to relieve pain and inflammation. A mixture of turmeric powder and slaked lime is applied topically as a household remedy to cure injury-related sprains and swelling. Turmeric is also an effective household remedy for sore throat, cough, and common cold, where it is taken orally with tea or hot milk. Study conclusion: Curcumin primarily exerts its therapeutic effects by inhibiting the degradation of IÃŽÂºBÃŽÂ± and subsequent inactivation of NF-ÃŽÂºB, thus initiating a cascade of downstream inflammatory and immunogenic events. Curcumin’s inhibition of NF-ÃŽÂºB activation, in turn, leads directly to the inhibition of expression of a number of proinflammatory cytokines (e.g., TNF, IL-1, IL-2, IL-6, IL-8, and IL-12) and downregulation of the mRNA expression of several proinflammatory enzymes (e.g., COX, LOX, MMPs, and NOS). In addition, curcumin’s immunogenic response is further enhanced by its ability to inhibit TLRs. Finally, curcumin exerts proimmune activity in several autoimmune disorders including Alzheimer’s disease, multiple sclerosis, cardiovascular disease, diabetes, allergy, asthma, inflammatory bowel disease, rheumatoid arthritis, renal ischemia, psoriasis, and scleroderma. Overall, these findings suggest that curcumin warrants further consideration as a potential immunoregulatory treatment in various immune disorders. Overwhelming, to say the least. P.S. Yesterday I added my EGCG page to my Pages section (right hand of your screen). It has more information and study links compared to my EGCG posting. I also found a couple of interesting studies on EGCG and resveratrol used together with chemotherapy. A friend sent me a March 19 WNBC news report on the Menu Foods pet food tragedy, which really upset me. According to this report and to others that I read earlier today, Menu Foods fed tainted food to dogs and cats in their laboratories AFTER they received complaints of household pets getting ill and dying all over the U.S. These tests were carried out BEFORE the general recall, and, as was to be expected, an unknown number of the lab animals got sick and died. The behaviour of this company is nothing short of criminal. By the way, this has a lot to do with my blog theme. My three (very funny) house cats are at the top of my happy list. Right up there with my husband. Whenever I have a not-so-good moment (rarely, to tell the truth), all I have to do is go over to one of my cats, and I get cheered up instantly. When I had pleurisy last year, they wouldn’t move from my bed. In 2005, when I was a bit creaky at times and had to go up the stairs slowly, they walked up with me. We could learn so much from the animals that live with us, and we should protect those who do not. A MMA listserv friend, whose MGUS is stable on a daily intake of ( â‚¬”)-epigallocatechin-3-gallate, the green tea polyphenol known more familiarly as EGCG, as well as resveratrol, flaxseed oil capsules and curcumin, recently sent me a few interesting links. Until then, I hadn’t really taken EGCG into consideration. I stand corrected. Even though curcumin and EGCG have nothing to do with paid assassins, I thought of the 2005 Mr. and Mrs. Smith movie as I was reading through these studies. The movie, for those who haven’t seen it, is about a seemingly ordinary married couple who turn out to be professional killers (unbeknownst to each other). When working separately, they are first-class killers, just like curcumin and EGCG, but when they join forces in the end they become invincible and exterminate all the bad guys (MM cells, in my little scenario). As my more scientifically-minded friend wrote me in a recent e-mail: “in the case of neoplastic B-cell lymphocyte differentiation into plasma cells, we are looking to curcumin and EGCG not for their anti-oxidant effects, but for their downregulation of NF-kB, which both achieve at different stages of the cell cycle, making them synergistic in this particular cellular scenario.” Perfect! I realize that all this information can be overwhelming. However, the important conclusion is that these findings, and my friend’s stable MGUS, suggest that EGCG would be a good addition to a MM patient’s intake. An invincible combination? Mr. And Mrs. Smith? Let’s hope so. Having found this Italian connection by pure chance, I decided to post a recipe that I read in today’s AICR Weekly Health-e-Recipe e-mail, and add a couple of my own suggestions. My variation on the AICR recipe would be to cook your own (organic) artichokes instead of opening a can or jar. This is what I do: peel off the tough outer leaves, cut off the sharp tops, peel down the stems, dig out the choke, then wash and cut the artichoke into 4 or 8 pieces. I cut off, trim down a bit, and use the stems, too. You can then soak them in water with some lemon juice so they won’t discolour. Cook them in (just a little) boiling water together with cloves of garlic and parsley, as much as you want (don’t forget to eat the garlic and breathe on someone afterwards). I sometimes add a bit of lemon juice to the boiling water. Add salt and pepper, and, if you feel adventurous, a dash of red pepper (capsaicin, the MM-killer! ), too. You can eat the artichoke pieces with a bit of extra virgin olive oil as condiment, or put them into a food processor with some freshly ground flaxseeds, the cooked garlic and parsley, and make a spread or a sort of pesto sauce to be used on pasta. (By the way, you can freeze the artichoke pesto to be used when this vegetable is no longer in season.) Or you can use the cooked artichokes as the basis for the more elaborate AICR recipe (see below). I would skip the mayonnaise, though! Another simple idea: Italians eat artichokes in pinzimonio, meaning you eat them raw, dipping the leaves and heart into a mixture of olive oil, lemon juice, salt and pepper. Easy! AICR Artichoke-Scallion Dip with Herbs: 1 can (14 oz.) artichoke hearts, packed in water, drained; 2 scallions, thinly sliced; Lemon juice, optional; 1/2 tsp. dried thyme; 1/2 tsp. dried basil; 2 Tbsp. low fat mayonnaise or sour cream; 2 Tbsp. nonfat plain yogurt; 1-2 tsp. spicy mustard; Salt, to taste; 1/4 cup chopped fresh parsley, garnish. In a food processor or blender, purÃƒÂ©e all of the ingredients until smooth and creamy. Spoon the mixture into a serving dish. Chill for at least 1 hour before serving. Garnish it with parsley. The dip can be made 1 day in advance. Makes 1 cup. Per 2-tablespoon serving: 32 calories, <1 g. total fat (0 g. saturated fat), 6 g. carbohydrate, 2 g. protein, 2 g. dietary fiber, 302 mg. sodium. Myeloma cell (abnormal plasma cell) making M proteins. I was looking up material for an upcoming post on germs and came across this fantastic sketch on the National Cancer Institute website: http://www.cancer.gov/cancertopics/wyntk/myeloma/page3 . As soon as I saw it, I thought “hey, those look exactly like little EYES. And they are looking straight at me.” This image is really going to help improve my visualizations. Instead of being amorphous hairy blobs scampering away from me and my unsheathed sword, my MM cells are going to have eyes now. Shapeless purple eyes. By the way, this NCI page has an excellent explanation of how MM cells form, and what happens when you have MM. A note of criticism: the NCI should really update its complementary and alternative and nutrition pages. Other than that, well done.